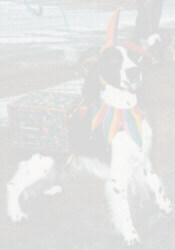 Bonny, our first "show dog", was a funny, intelligent black & white girl. Born March 11, 1991 she joined "Mandy", Baie d'Or Amandine, in our household when Mandy was almost 12 years of age. 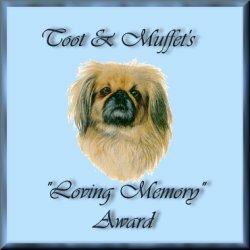 Bonny's joy of life & wonderful personality, we think, helped Mandy to enjoy 3 more wonderful years. Bonny completed her Canadian championship in November 1992. She is pictured above at 20 months of age. 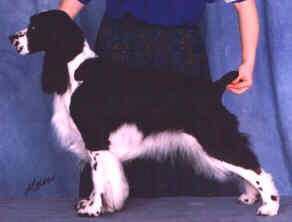 In Obedience -- Bonny loved to entertain & often thought that that was her job in the obedience ring. She had outrageously funny routines (except in Lynn's, the handler's, eyes) at the ESSFTA 1992 & 1993 Nationals. She did complete her Canadian CD in 1993. In Tracking -- Bonny loved to perform any kind of work, but tracking was her particular favourite. She obtained her American TD (in her first try) at the ESSFTA 1992 Nationals in Olympia. She obtained her Canadian TD (also in her first attempt) in September of 1992 at a trial in Calgary. Although she was trained to the TDX level, she was not able to obtain this title before her untimely death. 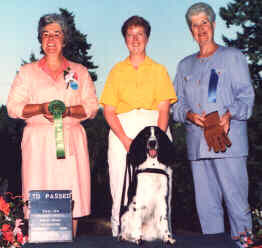 She is pictured below, with Lynn, being awarded her TD at the 1992 ESSFTA Nationals. and become a winner right from birth. with flying colours, red, yellow and blue. you got your novice and that was enough. you sailed right through with style and ease. in Canada too, you were the best. You had your picture taken! like you were supposed to do. You met with everyone's approval. Last revised: October 08, 2009.